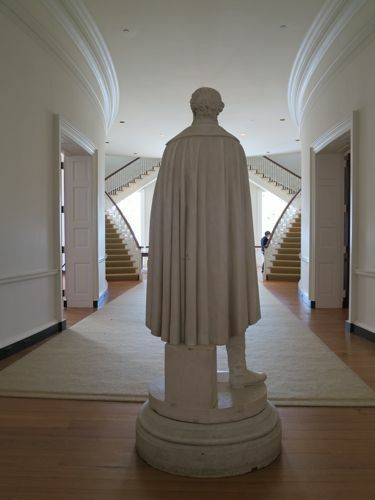 BACK-TO-BACK VISITS last month to Mount Vernon and Monticello upended my preconceived notions. 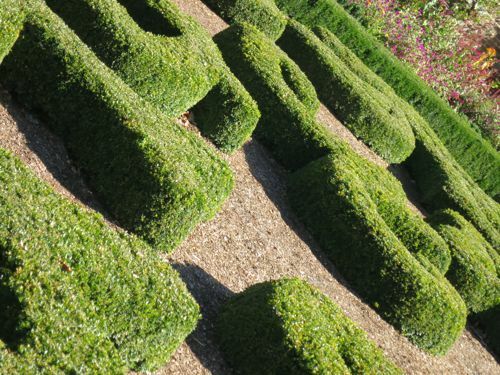 Based on what I’d heard from friends before the trip — “Mount Vernon? Yeah, sure. 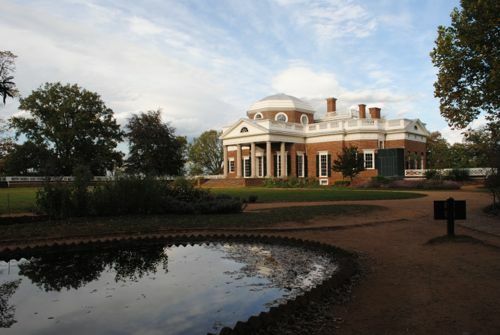 But I loooovved Monticello!” — I expected the highlight to be Jefferson’s quirky abode in the Blue Ridge Mountains. 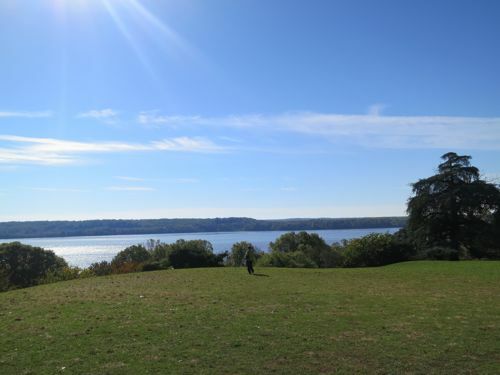 As it happened, I found Washington’s Mount Vernon, below, no less beautiful or fascinating. 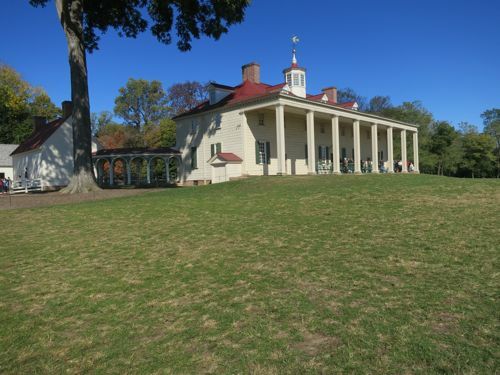 Though they’re both 10’s as travel destinations (and it’s shocking that I’d never been to Monticello at all, and to Mount Vernon only as a child), the surprise was that I looooooovvvved Mount Vernon. Neither is a McMansion by today’s standards, having relatively few small bedrooms (Mount Vernon six and Monticello eight) — and no bathrooms! Even in square footage terms, they are pretty intimate — definitely homes, not official buildings. 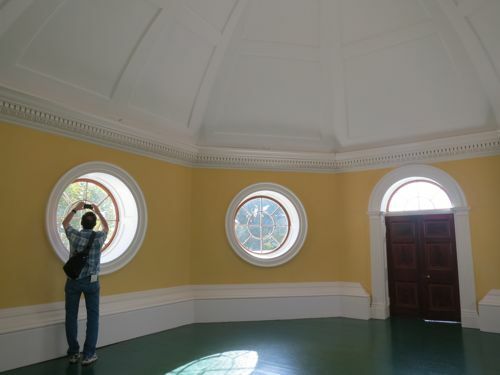 At Mount Vernon, the famous two-story dining room was being renovated, so we were denied the sight, though I found the four or five ground-floor rooms that were open to view, one with kelly green walls and one with Prussian blue, highly satisfying (interior photography is not permitted, regrettably). 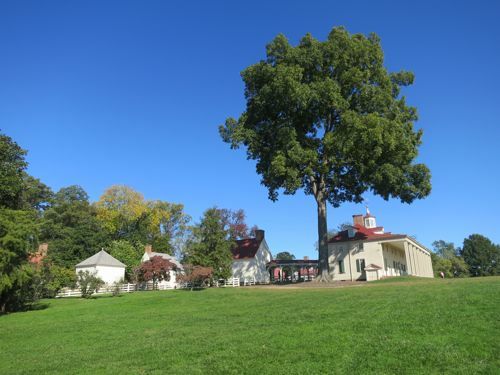 The Mount Vernon Ladies’ Association, which has owned the house since 1858, has acquired many of the original furnishings in Washington’s tastefully restrained style. 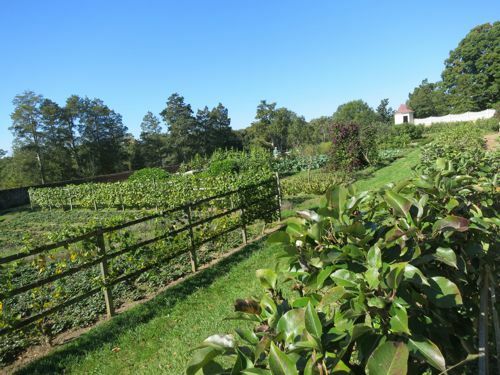 The view of the Potomac, above, and formal, English-style vegetable and flower gardens, are spectacular, and the dozen original outbuildings, each set up to illustrate the workings of the estate — carriage houses, smoke houses, ice houses, etc. — very well-done. The house itself, of wood covered with a stucco-like material to give it the appearance of stonework, and in the style of 18th century English country houses, began as a four-room cottage built by Washington’s father. 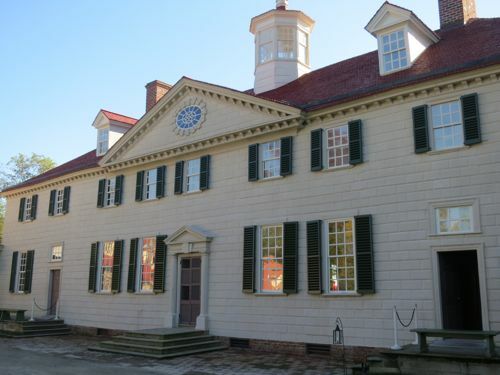 He inherited it from his half-brother in 1761 and expanded his acreage to 8,000, as well as building the house up and out, with a columned portico, below, that runs the width of the house in back, on the river side, and curving colonnades in front that welcomed visitors as their carriages came up the long drive. The commentary was a bit perfunctory, with one docent in each room tasked with keeping the line of visitors moving along. In response to one question, a docent replied, “Google it.” Still, I learned a lot about hospitality and housekeeping in those days, and how it was accomplished with the help of 160 or so slaves who lived in rustic quarters some distance from the house. 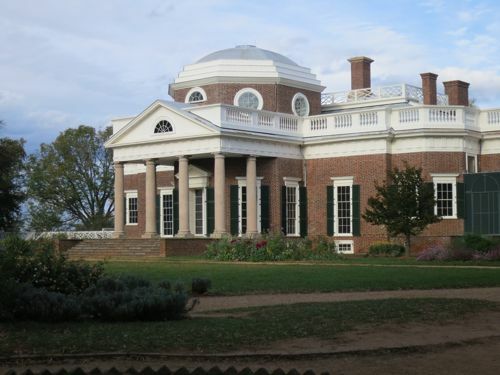 We took the three-hour drive west to Charlottesville and Monticello partly along Route 20, the same route Jefferson and his friends James and Dolley Madison, who lived thirty miles away, took when they visited each other’s homes — a 9-hour journey in those days. It’s a two-lane road, unspoiled and scenic, unlike the big-box shopping horrors we encountered getting out of Northern Virginia, and came as a great relief. The next two days were spent in the Charlottesville area, never out of sight of the Blue Ridge Mountains. We rolled into Charlottesville ready for a cocktail, and stumbled upon the C&O Restaurant, left, so named for the Chesapeake and Ohio Railroad whose trains run nearby. This little haven of hipness became our spot; we returned the next night for dinner. 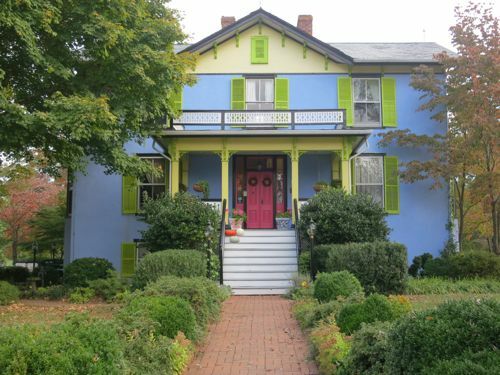 Our accommodations at the High Meadows Vineyard Inn, below, a brightly painted Victorian in nearby Scottsville, seemed at first to suffer from the B&B curse: an excess of knick-knacks and dried flower arrangements. 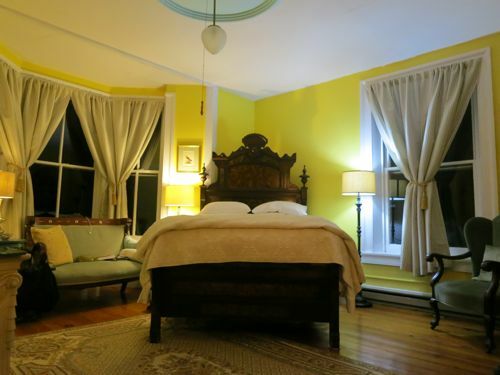 But I quickly came to love our yellow, bay-windowed room with a claw-foot tub, the working vineyard outside the window, and Henry, the resident peacock. Our Monticello tickets, for the “Behind the Scenes” tour ($42) that includes the upstairs bedrooms, were for 2:30PM, so we took the following morning to explore Charlottesville, especially its 6-block pedestrian shopping area, below, created from mostly Deco-era storefronts, with half a dozen independent bookstores, fashionable clothing and shoe boutiques, and local food shops. 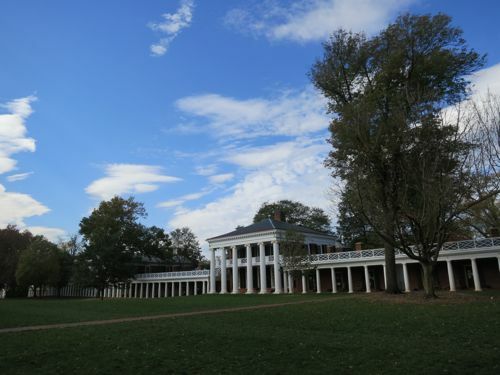 We also took in Jefferson’s magnificent University of Virginia campus, below, where we got a foretaste of his infatuation with columns, pediments, domes, and other elements of classical Greek architecture. 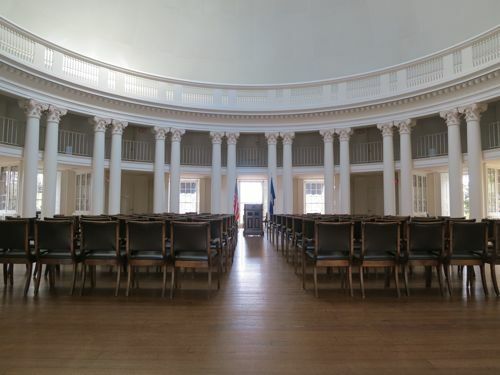 It was heartening to see students actually studying in the inspiring rotunda. Monticello, below, a couple of miles up a wooded mountain studded with apple orchards and the c.1784 Michie Tavern (where we hoped to have lunch but found nothing remotely vegetarian), is extraordinarily well-organized, with a museum/shop/cafe complex below and a frequent shuttle bus up to the pinnacle. My first sight of the house came as slight shock, though I’d seen images (notably on the nickel!) 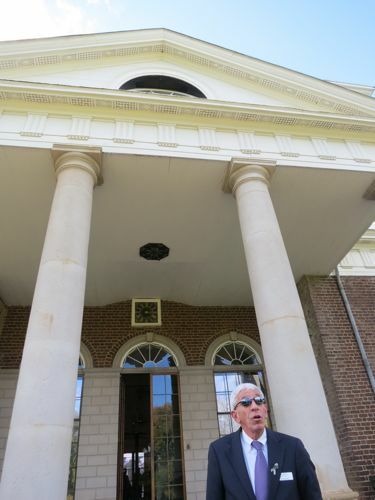 I’d admired the classical architecture at UVA, but the oversized pediment and columns used on a home appeared pompous. 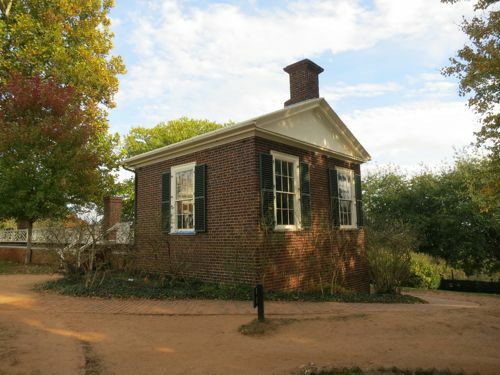 I tried to remember that Jefferson was the first to do it, and that Monticello is considered an outstanding architectural achievement — but initially the red-brick house looked to me like nothing so much as a bank. Our good-natured docent, left, a John Updike lookalike, answered every question patiently and thoughtfully. 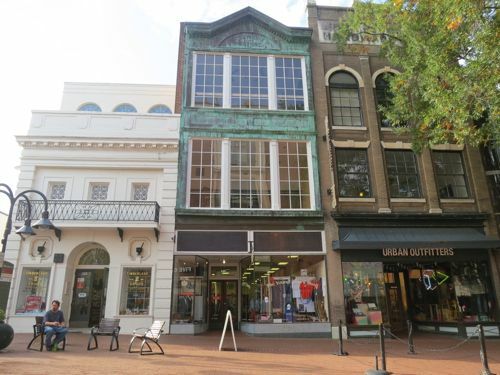 More beautiful from this angle…by the end of the day, the architecture grew on me. Inside the front hall, the expected staircase is absent. Instead, there’s a square room surrounded by a balcony and hung with replica Native American artifacts representing those brought back by Lewis and Clark. Jefferson kept such items in that reception room, where he greeted members of the public who traveled to see him; he was intent on educating them as they waited for their audience. The most elegant room is a semi-octagonal parlor with long French windows, one of the country’s first parquet floors, and about fifty portraits and copies of paintings by European masters hung floor to ceiling. Jefferson didn’t believe in grand staircases, we were told, considering them a waste of space. 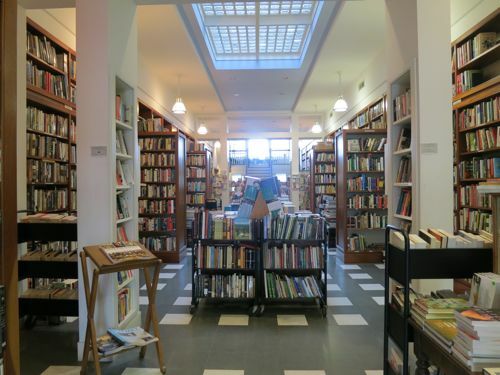 The only way to the upstairs bedrooms is via two steep, narrow, winding rear staircases, like those of an Amsterdam canal house, which women carrying babies and perhaps candles, and slaves carrying firewood and perhaps babies and candles, were forced to use. 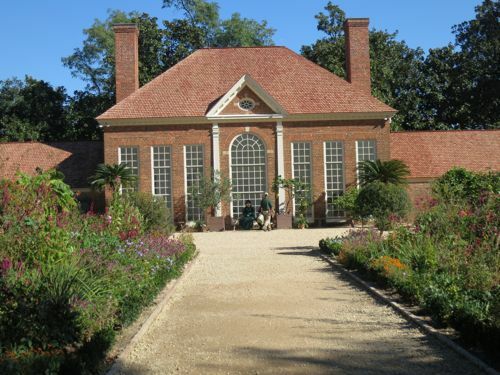 Jefferson had his own mancave — a library, study, and bedroom — on the ground floor. The house has a couple of doors to nowhere, windows at floor level, and other architectural quirks, including a hard-to-access dome room at the top of the house, below. It is beautiful and harmonious but was apparently almost never used, except for storage and by some Jeffersonian grandchildren as a hideout. In short, I ended up admiring the uneducated Washington’s architectural skills more than the highly educated Jefferson’s. 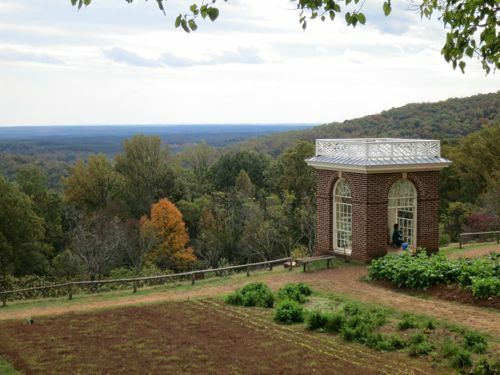 Monticello is a good place to ponder the irony of the man who wrote “All men are created equal” owning some 300+ slaves who lived in outbuildings and chambers beneath the house, a whole subterranean world of utility and organization which is also open to the public. I was moved by his personal struggles, though; Jefferson had some six ‘official’ children, only one of whom lived to reproduce. Many of his offspring, including some descended from Sally Hemmings, a slave in his employ, as well as Jefferson himself, are buried in an atmospheric cemetery partway down the mountain. One of my favorite parts of the estate is the one-room mini-Monticello, below, where the young Jefferson and his wife lived for two years before the main house was built. 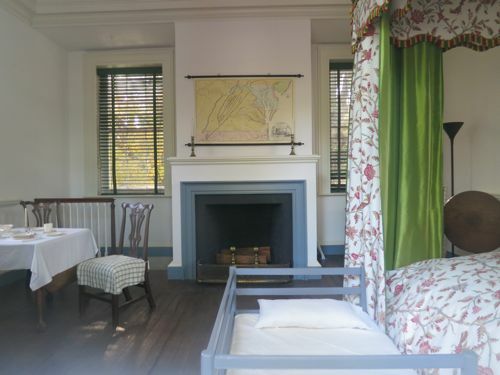 With bed, dining area, and study desk, the civilized cottage looks like almost all a couple would need. 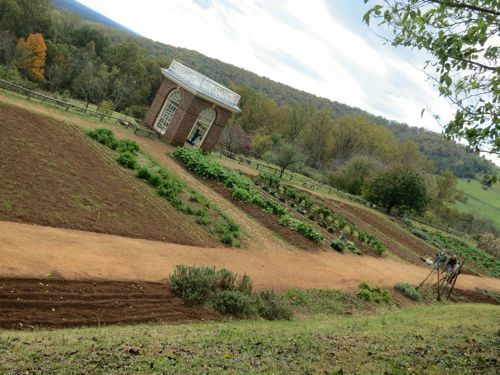 We ended the day with a 45-minute grounds tour, admiring the extensive vegetable gardens, below, restored to resemble how Jefferson laid them out. 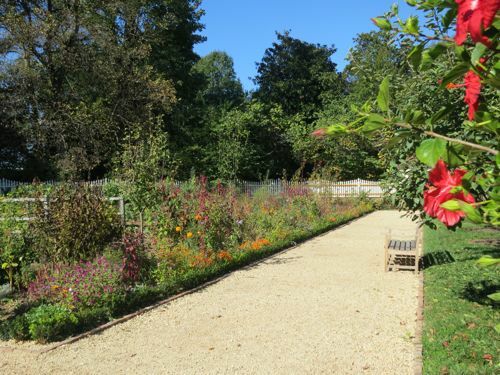 The perennial flower gardens around the front lawn were curiously bedraggled at end of the season, but also perhaps because the caretaking is in transition. 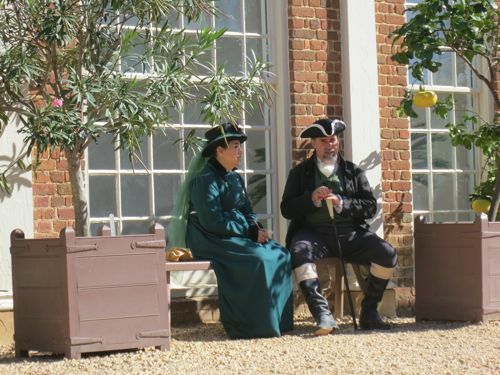 The longtime gardener who supervised Monticello’s landscape for several decades recently retired, we were told, and is in the process of being replaced by someone new. I returned to New York with a better understanding of both men’s multi-disciplinary genius and cultural sophistication, and a sense of how far we’ve come in a mere couple of centuries. 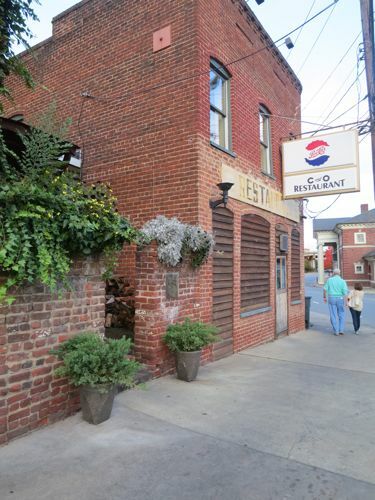 This entry was posted in ROAD TRIPS, TRAVEL and tagged architecture, C&O Restaurant, High Meadows Vineyard Inn, Michie Tavern, Monticello, Mount Vernon, Scottsville, University of Virginia, UVA, Virginia. Bookmark the permalink.